We have expanded our range of extra wide quilt back fabrics to help you finish off your quilts. They come in a range of styles, including subtle batiks. There is also a new Quilt Backs sample pack, C1400, so that you can sample our range. Well it has been a few weeks since I have had a chance to update the What's New Blog. I was down in London for a week and since then we have all been very busy here dealing with the Christmas rush. But we had a delivery on Tuesday with some new products so I have put them up now. 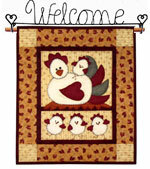 There is a new range of quilting stencils from Lynette Jensen's Thimbleberries. The stencils come in a range of sizes to fit different blocks and there are a number of designs, many with a floral theme. Illustrated is a 7" Burr Oak design. We also have a number of new books, including two that focus on combining photographic images with fabrics. Innovative Fabric Imagery for Quilts by Rymer and Koolish, is a must-have guide to transforming and printing your favourite images on fabric. Ref: 4544. £16.95.